This months Sweet Adventures Blog Hop is “Nuts about Sweets” and is hosted by Nic from Dining with a Stud. 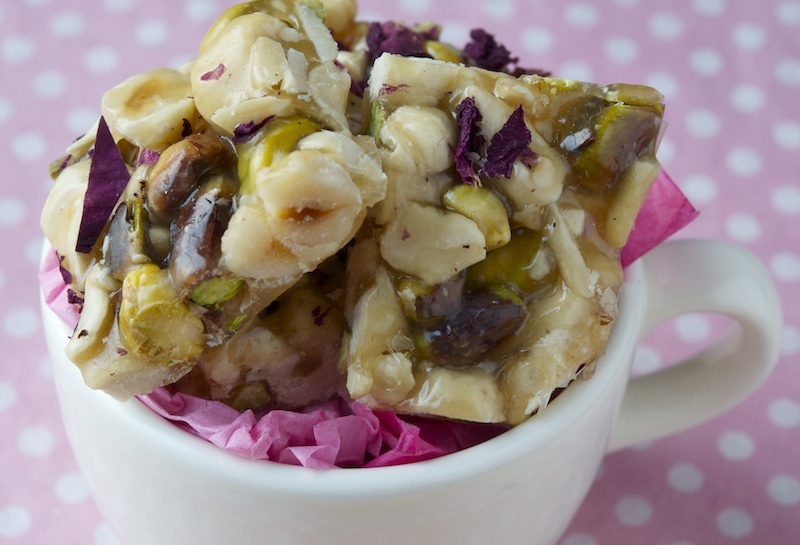 Nuts and seeds are good for your health… they help boost the immune system, are good for anemia, vision, memory, energy, muscles, a healthy nervous system and help lift your mood… well nut brittle definitely lifts the mood! We love nuts and seeds in our family and there is always some type of nut or seed stored in the fridge… making them a quick grab and go type of snack! Basic brittle is pretty much the same all over the globe, caramelized sugar surrounding some type of nut or seed! Sometimes other flavours such as cardamom, vanilla and rose-water may be added. In India they use jaggery instead of white sugar and refer to brittle as Chikki! The addition of baking soda in the recipe creates loads of tiny air bubbles and lightens the density of the caramel, making the brittle hopefully more tooth friendly! If you are not a nut or seed fan but love caramelized sugar, making honeycomb to nibble on is also a delicious sweet treat! Cut into neat pieces or broken into uneven shards it all tastes good and can be enjoyed with a nice cup of coffee or tea… but I especially love having these delicious nut treats with Arabic coffee! Pressing dried rose petals on top of the brittle while still warm and sticky adds a hint of rose flavour and a little glamour. Breaking the nut brittle into small pieces and mixing with a light sprinkling of vanilla sea salt to nibble on is a very moorish combination of sweet and salty! Note: It is important when making brittle that you have all your preparation done beforehand as brittle sets very quickly! How to make: Cover a chopping board with foil and grease with some unsalted butter or vegetable oil. Have on standby a large greased chopping knife and a small flat-bottomed stainless steel tin or cup (to help flatten the brittle), grease the bottom. Place a medium thick bottomed saucepan over gentle heat, add the water, butter, sugar and glucose. Gently stir with a wooden spoon making sure that all the sugar has been completely dissolved, brushing down the inside of the pan with a wet pasty brush if any sugar crystals have stuck to the sides! Once the sugar has been completely dissolved turn up the heat and bring the sugar syrup to a boil, leave to bubble without stirring until the sugar syrup takes on a very light golden colour. When the syrup is light golden remove from the heat and add the baking soda, followed by the nuts, gently but quickly coat the nuts with the now caramelized nut and immediately empty the contents of the pan onto the greased foil. Flatten the brittle with the bottom of the tin into about a 1/4 inch thickness. 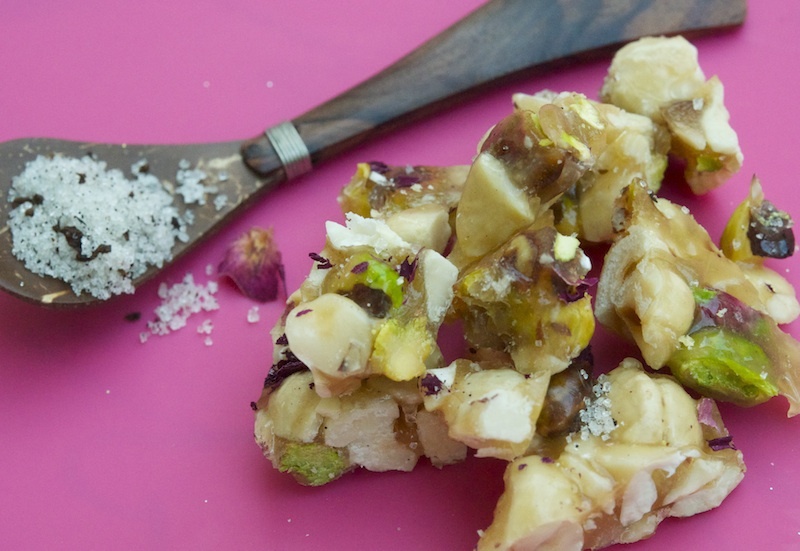 Press the dried rose petals over the top of the brittle, if using. While the brittle is still warm mark into desired shapes with the knife, makes cutting easier when cool. Sore in an airtight container. Before serving sprinkle over a little vanilla salt, if desired or when entertaining, leave a little dish of vanilla salt on the side and let guests salt their own brittle! This post is part of the Sweet Adventures Blog Hop Nuts about Sweets... click here and scroll down to the end of the post to see all the other nutty entries! Those rose petals def add some glamour. What a great iea 🙂 Thanks for joining the hop! You are a food goddess! Yum, yum, yum! 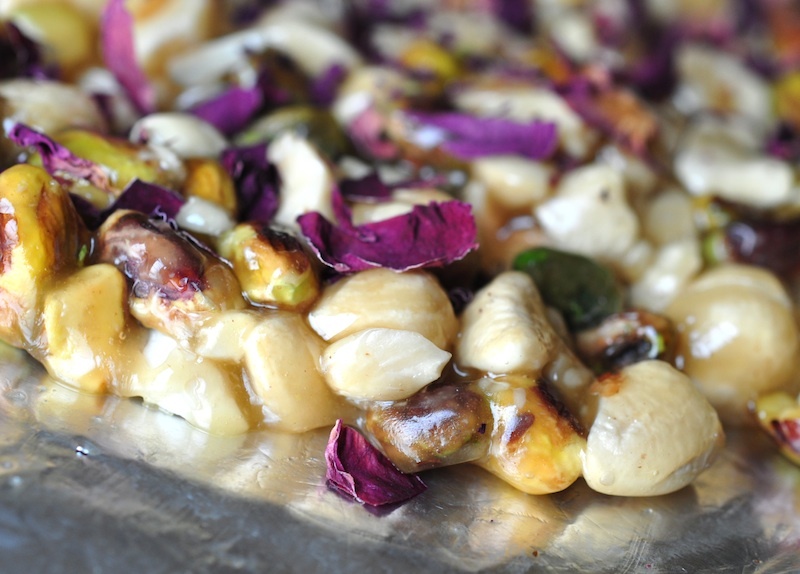 Your nut brittle looks absolutely beautiful Moya 😀 I love those gorgeous rose petals and the vanilla salt sounds absolutely divine. Beautiful, delicious gorgeous. I could do with some of your lovely brittle to make me feel better!